About: Avera McKennan Hospital & University Health Center, a HIMSS Analytics Stage 7 hospital and four-­time designated Magnet facility, is a 545-­bed tertiary hospital located in Sioux Falls, SD. The hospital is the flagship of Avera Health, a 33­-hospital system spanning five states, including South Dakota, North Dakota, Iowa, Minnesota, and Nebraska. The Need For Improvement: Nurses in Avera McKennan’s Emergency Department identified a segment of their patient population frequently using the ED for non‐emergent situations. This is a problem faced by EDs across the United States, with potentially avoidable visits estimated to be over 50 percent or about 67 million visits. Avera nurses took this challenge head on by implementing a nurse‐driven care manager program. Execution: The ED nurse navigator program focuses on patients considered “super utilizers” by providing personalized care management extending beyond the ED. 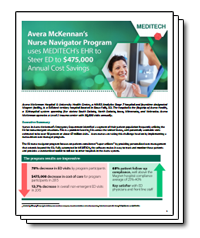 After working through the process on paper, they enlisted Avera’s IT team to automate the documentation in MEDITECH. IT maximized MEDITECH’s integration, documentation, and clinical decision support tools to capture all the data electronically, and embed alerts within the registration and documentation processes to improve communication and continuity of care within the ED. Results: The ED nurse navigator program leverages the power of electronic data to make a real difference in patients’ lives. MEDITECH’s Expanse EHR provides the ED nurse navigator with a bird’s eye view of what’s happening with the program’s patient population so they can observe emerging trends. 68% patient follow-up compliance, which is well above the Magnet hospital compliance average of 25%-40%. With the success of Avera McKennan’s ED nurse navigator program, Avera Health has begun implementing the program across their entire network. The initiative is easily replicated using tools already available within MEDITECH to automate a standardized nurse navigator toolkit. As the program expands, Avera will continue to use the data to further refine the program. Download our full case study to learn more about the nurse navigator program and how it’s fully automated in MEDITECH Expanse.